Two-color flow cytometric analysis of asynchronous Jurkat cells, using Cyclin B1 (V152) Alexa Fluor® 647 Conjugate and Phospho-Histone H3 (Ser10) Alexa Fluor® 488 Conjugate #9708. Cells represented in green are positive for cyclin B1 and phospho-histone H3, while cells represented in blue are positive for phospho-histone H3 and negative for cyclin B1. Both cell populations (green and blue) correspond to cells undergoing mitosis. Cyclin B1 (V152) Mouse mAb (Alexa Fluor® 647 Conjugate) detects endogenous levels of cyclin B1 independent of phosphorylation. Monoclonal antibody is produced by immunizing animals with a peptide corresponding to a sequence from hamster cyclin B1. The antibody was conjugated to Alexa Fluor® 647 under optimal conditions with an F/P ratio of 2-5. The Alexa Fluor® 647 dye is maximally excited by red light (e.g. 633 nm He-Ne laser). Antibody conjugates of the Alexa Fluor® 647 dye produce bright far-red-fluorescence emission, with a peak at 665 nm. 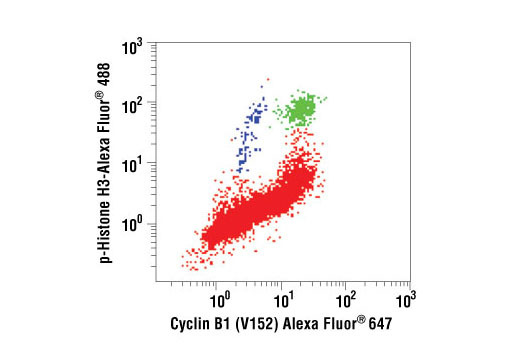 Cell Signaling Technology Antibody conjugated to Alexa Fluor®647 fluorescent dye and tested in-house for direct Flow Cytometric analysis of human cells. The unconjugated antibody #4135 reacts with, among others, human, mouse and hamster Cyclin B1. CST expects that Cyclin B1 Mouse mAb (Alexa Fluor®647 conjugate) will also recognize Cyclin B1 in these species. Cyclins are a family of proteins that activate specific cyclin-dependent kinases required for progression through the cell cycle. The entry of all eukaryotic cells into mitosis is regulated by activation of cdc2/cdk1 at the G2/M transition. This activation is a multi-step process that begins with the binding of the regulatory subunit, cyclin B1, to cdc2/cdk1 to form the mitosis-promoting factor (MPF). MPF remains in the inactive state until phosphorylation of cdc2/cdk1 at Thr161 by cdk activating kinase (CAK) (1,2) and dephosphorylation of cdc2/cdk1 at Thr14/Tyr15 by cdc25C (3-5). Five cyclin B1 phosphorylation sites (Ser116, 126, 128, 133, and 147) are located in the cytoplasmic retention signal (CRS) domain and are thought to regulate the translocation of cyclin B1 to the nucleus at the G2/M checkpoint, promoting nuclear accumulation and initiation of mitosis (6-9). While MPF itself can phosphorylate Ser126 and Ser128, polo-like kinase 1 (PLK1) phosphorylates cyclin B1 preferentially at Ser133 and possibly at Ser147 (6,10). At the end of mitosis, cyclin B1 is targeted for degradation by the anaphase-promoting complex (APC), allowing for cell cycle progression (11). Research studies have shown that cyclin B1 is overexpressed in breast, prostate, and non-small cell lung cancers (12-14). Lorca, T. et al. (1992) EMBO J 11, 2381-90. Harper, J.W. and Elledge, S.J. (1998) Genes Dev 12, 285-9. Toyoshima-Morimoto, F. et al. (2001) Nature 410, 215-20. Li, J. et al. (1997) Proc Natl Acad Sci U S A 94, 502-7. Takizawa, C.G. and Morgan, D.O. (2000) Curr Opin Cell Biol 12, 658-65. Santos, S.D. et al. (2012) Cell 149, 1500-13. Jackman, M. et al. (2003) Nat Cell Biol 5, 143-8. Gong, D. and Ferrell, J.E. (2010) Mol Biol Cell 21, 3149-61. Mashal, R.D. et al. (1996) Cancer Res 56, 4159-63. Kawamoto, H. et al. (1997) Am J Pathol 150, 15-23. Soria, J.C. et al. (2000) Cancer Res 60, 4000-4.